Early connectors were all produced with flat end-faces, which were specified to be close (the linear tolerance on the SMA, for example, being 8 microns), but too specifically avoid actual contact. As Polishing evolved the PC (Physical Contact) concept was developed–spherical end-faces, with the fibers making actual physical contact–The PC finish resulted in much improved performance because air-gap was eliminated which allowed increased light wave transmission. The early PC connectors, preceding development of the now common pre-radiused ferrules, required spherical forming of their flat end-faces as part of the polishing process. These traditional polishing techniques, for singlemode PC connectors, involved a four-step process: epoxy removal, ferrule forming, preliminary polish and a final polish. These steps used aggressive materials for the epoxy removal and ferrule forming steps, generally accomplished by using a diamond polishing film. Now, however, almost all connectors are "pre-radiused", and the polishing process should avoid excessive disruption of the spherical surface–the sort of thing a mechanized process can do well (and a manual process poorly). 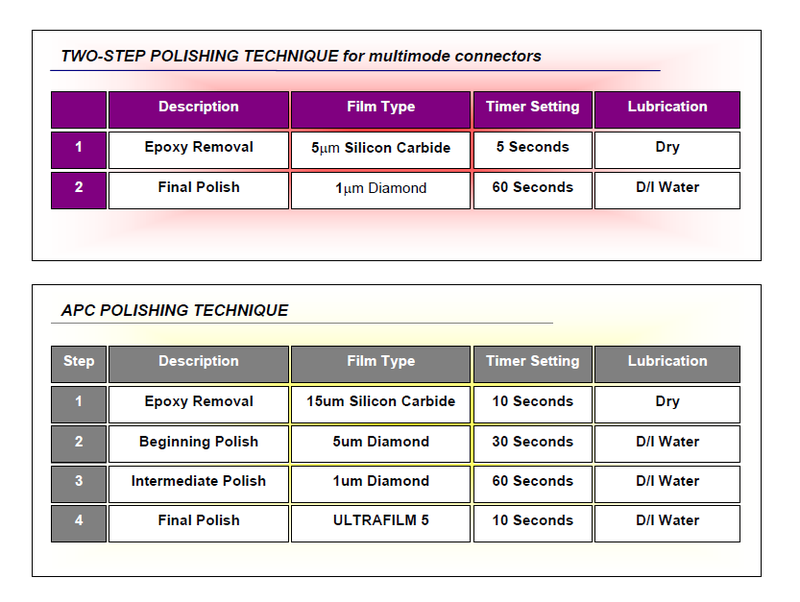 As a result reducing the cycle time and changing the film gradations to adapt to the current connector configurations has revitalized the traditional polishing techniques. Now, the traditional four-step process is much improved (epoxy removal, beginning polish, intermediate polish and final polish). The following is a list of polishing techniques for singlemode & multimode polishing. More recent polishing techniques indicate that the aggressive epoxy removal and ferrule forming steps that were previously popular should be minimized during the polishing process, increasing reliance on the pre-formed radius. This can be accomplished by using finer grades of silicon carbide for the epoxy removal and by replacing or even eliminating the ferrule-forming step. The most current techniques use a three-step process; epoxy removal, ferrule polishing and fiber polishing. This technique offers higher levels of output while maintaining current performance standards, and results in lower cost per connector. Machine polishing is the only practical means available to meet the demands for increased performance and production. To the extent that manual polishing can be effective, it demands performance by highly skilled personnel (for a repetitive and monotonous task), and, as the specifications become more difficult–SPC, UPC, APC–manual polishing becomes an unreasonable (if not impossible) task. As in other "high tech" fields, the ability of machines to perform repeatable ultra-precision tasks is the answer. As described above, a Polishing Machine should have good instructions and a "recipe" for producing polished connectors that meet all specifications. There are a number of variables, however, which affect the process, about which the industry continues to learn and develop. It is important that the machine selected has the capability to incorporate new developments and that the manufacturer keeps you informed and is available for support and advice. In some cases, the machine user will become aware of some factors that involve variables other than the polisher itself. The following are a few items that are commonly overlooked. 1. 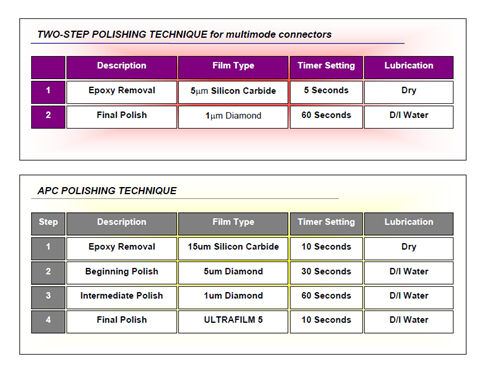 Polishing Films–Films are the most significant factor in your polishing operations. Quality and gradations vary from supplier to supplier. When a polishing technique is developed the film type, make and particle size must be chosen carefully. Excessively aggressive films can destroy a 125μm fiber, and the spherical radius can be disrupted beyond repair. Also, of critical importance to real cost, is the initial cost of the polishing film as it relates to the cycle life that the films provide–this can vary significantly from various manufacturers. below) will increase the film life and decrease the cost per connector. 2. Epoxy–different types of epoxies can be removed more easily with specific grades of silicon carbide polishing films. The films to use on this step depend on the epoxy type and the size of the epoxy bead mounted on the connector end-face. Different epoxies have varying levels of hardness–some are tacky, and some are firm–Hard epoxies are removed easily with coarser particle sized films (20 um, 30 um, etc. ), while softer epoxies are better suited to smaller particle sized films, i.e. 9 um, 5 um, etc. Tip–The epoxy bead that remains on the connector before polishing should be minimized (the size of a pinhead). This will extend the life of all the polishing films. Also, try different gradations of silicon carbide until you find the epoxy removal film that works best for your needs. Deionized/Filtered Water–Clean water is needed to prevent foreign particles from destroying the polish. Tap water and other water sources, contain particles (dirt) that can be as large as 15 microns. Debris of this size will destroy a polished connector. Deionized or Filtered Water will eliminate this possibility. transferring to the next polishing step. Lint-free Tissues–The tissues will be used to apply the alcohol to the films, connectors and machine. The tissues will also be used to dry the connector end face before the testing and inspection stage of the polishing process. Lint-free Swabs–Always clean the reference meters and couplers will the swabs soaked in alcohol. Measuring instruments and coupling devices are the most overlooked pieces of equipment when creating a contamination free environment. Test equipment cleaning should become a habit. Repeated use of these instruments will result in debris build-up. If maintained properly, correct results can be assured with confidence, not to mention trouble shooting poor performance will be minimized. Canned Air–This is very useful for removing debris from connector couplers. It can also be used as a general cleaning agent to remove dust from connectors, films or the workstation. Tip–Check the reference cable end-face periodically for end-face defects. Connecting and de-connecting will result in debris build-up over a period of time. Clean the end-face with alcohol using a lint free tissue. Also, at some point in time the reference will need to be repolished. After repeated re-polishing the reference cable will need to be replaced. 4. Lubrication–deionized water, filtered water and suspensions, when used correctly can result in enhanced connector performance. The best solutions have very small particle sizes 20-60nm. The solution particle size should be at least half the size of the final polishing film. Solutions are used to decrease Return Loss by as much as 5dB. Be careful of colloidal based solutions. They tend to dry quickly and can destroy a polish if it is not removed from the connector end-face quickly. Also, place the solution is a dry area at room temperature. Guard solutions from cold temperatures. Many solutions loose their ability to improve performance as they become more solid (dense). Tip–Dilute the solution. Any range of 2 to 5 parts filtered/deionized water to one part solution may improve your performance. Mechanical polishing machines provide fiber cable manufacturers and original equipment manufacturers with an economical means of meeting high production requirements while maintaining the high quality levels that are demanded. While using polishing machines has become a necessity, it is important to use judgment in machine selection. It is reasonable that manufacturers be asked for objective evidence to back up performance claims (the existence of automatic test equipment that provides a printed copy of test results makes this possible), to provide references, and samples of your components for your own inspection. Don’t overlook the fact that this is still a dynamic and growing field. Connectors will change and processing techniques will improve. It is important to have equipment that can readily adapt to changes of connector configuration and polishing technique. And it is equally important that the equipment manufacturer be aware and involved in these developments, and communicates effectively with users of their equipment. High performance and economical manufacture represent a challenge to all of us in the industry, and it seems apparent that the challenge is being met effectively. It is an indication of a bright future for fiber optics communications, a future in which a company that is properly prepared can prosper.